The most informative, diverse and beautiful Arabian horse publication… It educates, enlightens and WOWS you with incredible words and stunning images of our most amazing breed! 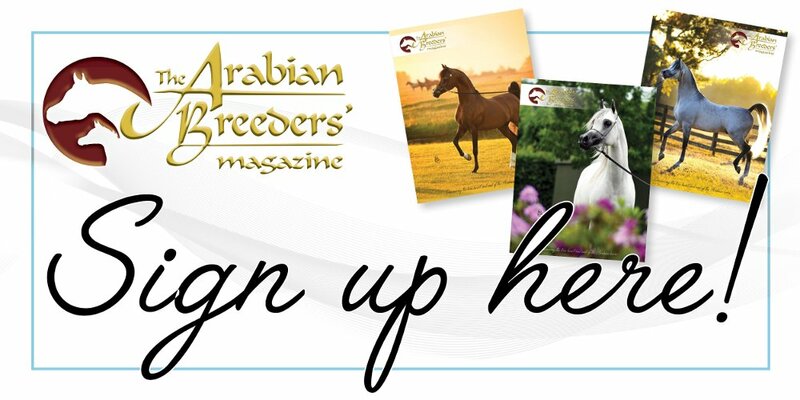 The Arabian Breeders’ Magazine continues to be a pioneer among the other Arabian horse publications, and it remains the breeders’ choice, classed as “the magazine for the intelligent Arabian horse breeder”. Indeed, The Arabian Breeders’ Magazine continues to fly the flag for the Arabian horse. For at The Arabian Magazine, we continue to be different: hence, The Arabian Breeders’ Magazine is a publication dedicated to learning as well as the sharing of knowledge and experiences from a range of breeders around the world. Each page that you turn celebrates the true heart and soul of the Arabian horse that captured us so much those years ago, and nudged us on to this incredible journey we are on. Add to this that we have the lowest rate card in the industry, combined with the high quality of this coffee-table publication, it is little wonder that The Arabian Breeders’ Magazine truly has become the number one choice for breeders the around the world. Work is about to begin on the March edition, which will be showcased at the Arabian Breeders’ World Cup in Las Vegas, as well as at the first shows in Europe as the new season begins. More important, however, than being found at the shows, The Arabian Breeders’ Magazine is found on the coffee tables and in the barns of many breeders around the world, who are no doubt continuing their never-ceasing search to improve their programme. The deadline for this edition is 28 February. Book your space now by e-mailing info@thearabianmagazine.com or calling +44 (0)1508 536099 during UK office hours. Our prices remain incredibly competitive, starting at £275 GBP (€295 euros, $325 US) per page. We look forward to sharing your horses with discerning breeders around the world. Join us today and part of this very special, revolutionary and much-applauded publication. PS – want to see this beautiful publication? Sign up today through The Arabian Magazine Shop.